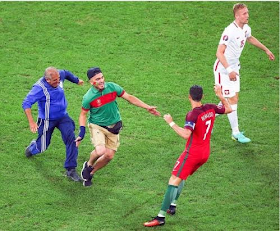 A fan shocked a football stadium in Marseille last night as he sprinted into the football field aiming for Cristiano Ronaldo during the Euro 2016 quarter final game against Poland. Moments later around a dozen security guards rush after the fan, tackling him down to the ground and handcuffing him. From the look on Ronaldo's face you could see how shocked he was as he tried his best to evade the over zealous Portugal fan.